**Thank you Vitamix for sponsoring this post. 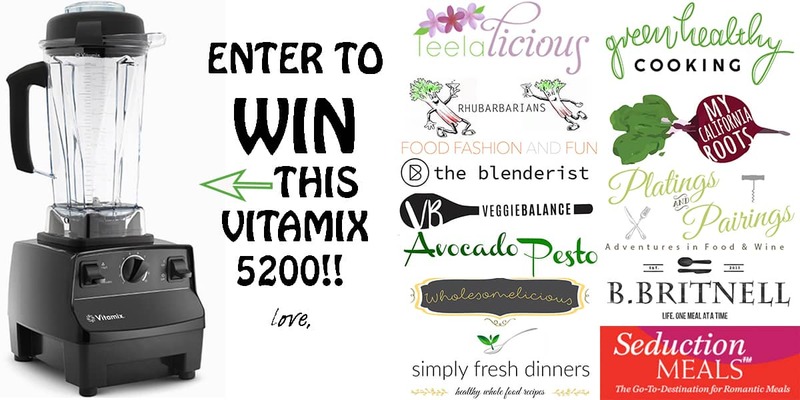 Scroll down for your chance to win a FREE Vitamix!!! 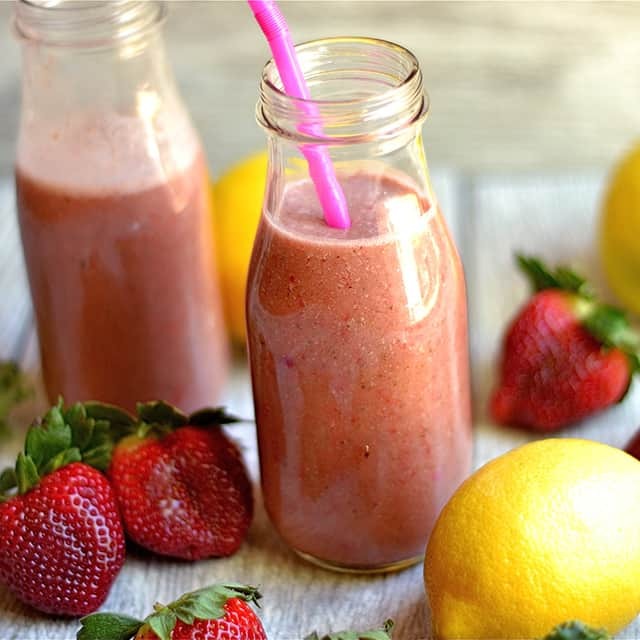 Strawberry Lemonade Smoothie is a refreshing, delicious smoothie packed with nutrients!! 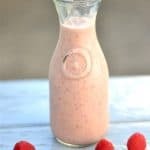 A smoothie that the whole family will love and is perfect for warm weather, a post-workout, after school snack, or addition to your breakfast. I’ve been determined lately to get my stubborn 8 year old carbivore back to her smoothie drinking ways. She has been in a mood; mainly refusing to drink all her breakfast smoothies. So in an effort to change things up a bit, I thought she would be willing to try and love (fingers crossed) this strawberry version with lemons. With lemonade being her favorite non-water drink, I was thinking this would be a winner. No bananas, no other berries, and some coconut oil for some healthy fat. I did add some honey for the kids, but I felt that mine was better a bit more tart without the honey. I feel like I found the perfect recipe for a smoothie that tastes like lemonade without all the sugar. I made this for an after-school snack for the kids, and an after hot yoga class for me…………..
She loved it!!!! In fact, she even said, “I hope this is going on the blog.” That’s her endorsement to share with all of you. My 6 year old little man drank it up too, but he is usually a lot easier to please and loves everything. I also love that this smoothie has some electrolyte restoring ingredients that are perfect for a post-workout. Lemons, strawberries, leafy greens, and coconut oil are perfect for refueling and balancing your electrolytes after a sweaty or hard workout. I added a sprinkle of himalayan salt, but you can feel free to omit that part if this is not served for a post-workout. Another post workout option is to add 1/2 coconut water/1/2 almond milk. 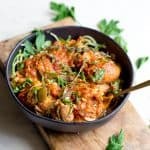 Something for everyone in this recipe! Place all ingredients into your high powered blender, and blend until smooth. Add additional 1 tbsp honey if sweetener is needed (good idea for a kid friendly option), or 1 tsp himalayan salt (for a post-workout drink). 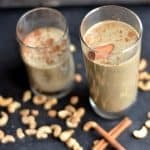 My personal favorite non-dairy milk is unsweetened Flax Milk. Feel free to use your favorite: almond, coconut, soy, cashew, etc. If using this as a post-workout drink, feel free to use 3/4 cup milk with 3/4 cup coconut water. 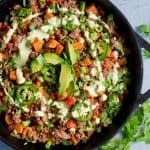 My favorite moments in the kitchen are spent with my kids, and I especially enjoy teaching them the importance of fueling their bodies with nutritious ingredients! A Vitamix is the perfect tool to teach a child of any age how nutritious food can taste delicious. Just in time for Mother’s day, we are offering a chance for one lucky MOM to win a free Vitamix!! Amy, your smoothie looks delicious, I totally get how you were able to finally please your kids! I’m sure mine would love this one, too! Will have to give it a try soon! This smoothie looks so refreshing Amy! Love it for the upcoming warm weather months! 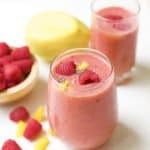 I make a similar smoothie with coconut milk but have never thought to put lemon in it – brilliant! 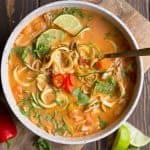 I add a banana and fish oil as well but the banana is feeling like too much at the moment so I’m going with your recipe. I’ll report back! 🙂 Thanks for the great idea. Thanks Keith, hope you enjoy!! 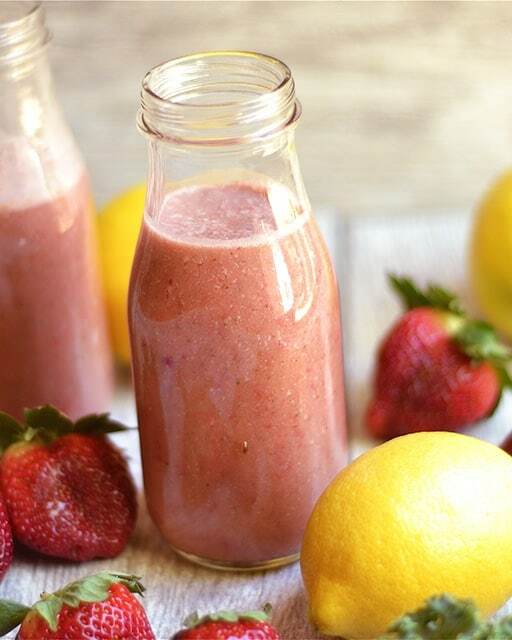 What a beautiful smoothie, and so perfect for Spring too! 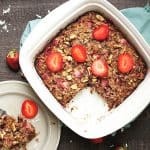 Yes, it’s different, but so yummy! Thank you Vicky! 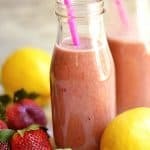 Can’t wait to try this yummy smoothie, strawberry is my favorite! Thanks Devon!! Hope you enjoy! I adore tart flavors! 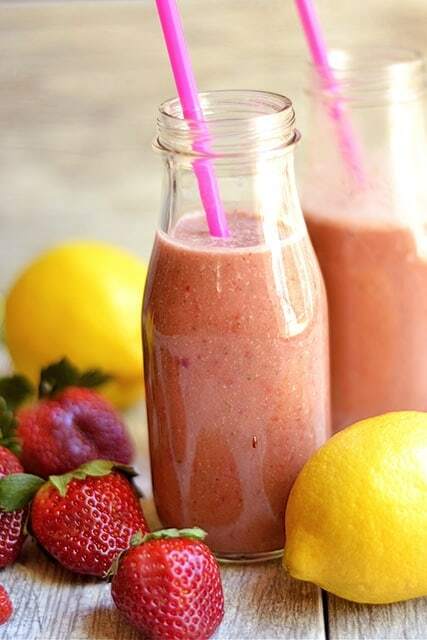 A berry lemonade smoothie sounds absolutely perfect to me. Great idea to add coconut oil and a pinch of salt for recovery.